As mentioned earlier Danny's Racing Team went to the National Finals in the UK. 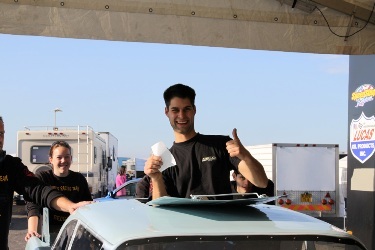 Not with Danny's Funny Car, but with Sandro's '55 Bel Air Funny Car to compete in Super Pro ET. Great atmosphere and very nice weather in Santa Pod. On Saturday at nine o'clock racing started for us. 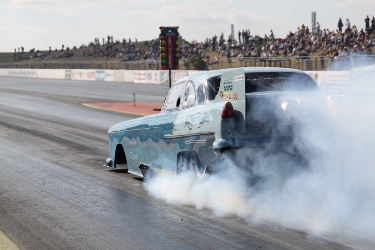 This was the very first outing of Sandro's car on the racetrack at Santa Pod. The crowd loved the good looking burnouts Sandro was pulling. During qualifying the Bel Air had all kind of problems. New track, gear problems, red light which seemed to love us, a car which went all over the place.........We found out that the wheelie bar was steering the car so we adjusted that and found a temporary fix for the gear problems. On Sunday during the first elimination round wewere paired up against Nick Good. Sandro took the win with a holeshot. In the next round against Brendan Clancy with his nice '53 Chevrolet Corvette, what a great pair, again Sandro had no first gear anymore at the start and couldn't catch up with Clancy. This was the end of the races for us. But we go home with a good feeling and are already counting the days to come back to the track.